The Martha Jefferson neighborhood is a Charlottesville neighborhood around the old Martha Jefferson Hospital. 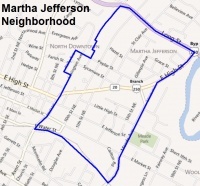 In April 2010, the Martha Jefferson Neighborhood Association formally asked the city to designate the neighborhood as a historic district. The district would include 125 structures along Locust, Lexington and Grove Avenues. During a meeting July 20, 2010, the Board of Architectural Review (BAR) unanimously voted to establish the Martha Jefferson Historic Conservation District. The new designation calls for extra scrutiny any time a property owner wants to demolish a building or construct a new one. ↑ Dixit, Rachana By. "Martha Jefferson Neighborhood Applies for Designation | Charlottesville Daily Progress." Charlottesville News, Sports, Business, Events and Jobs | Charlottesville Daily Progress. Web. 28 Apr. 2010. <http://www2.dailyprogress.com/cdp/news/local/article/martha_jefferson_neighborhood_applies_for_designation/55479/>. ↑ Feroldi, Jean. "BAR Reviews New Waterhouse Design, Grants Martha Jefferson Historic Conservation District." Charlottesville Tomorrow News Center. 22 July 2010. Web. 23 July 2010. <http://cvilletomorrow.typepad.com/charlottesville_tomorrow_/2010/07/july-2010-bar-.html>. This page was last edited on 2 June 2012, at 12:27.